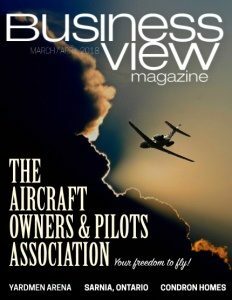 Business View Magazine interviews representatives from Baytown, Texas, as part of our focus on best practices of American cities. 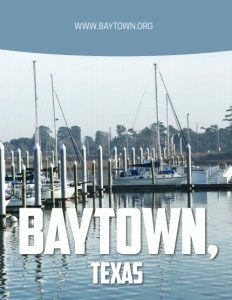 Baytown, Texas is a city within Harris County, and partially in Chambers County, in the Gulf Coast region of the Lonestar State. Located within the Houston–Sugar Land–Baytown metropolitan area, the city of approximately 85,000 lies along both State Highway 146 and U.S. Interstate 10. 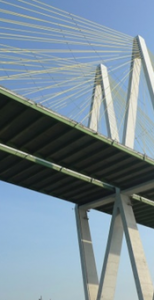 The area which became Baytown began to be settled as early as 1822, but it’s real nature was formed in the early 1900s, when Texas started becoming awash in oil. In 1916, the Humble Oil and Refining Company, founded by one-time Texas governor Ross S. Sterling and his associates, built the first offshore drilling operation in Texas, and the second in the United States, in the nearby Goose Creek Oil Field. Today, the foremost driver of Baytown, Texas’s economy is the downstream portion of the oil and gas sector. Whereas the upstream sector focuses on the production of those two fossil fuels, downstream takes what is produced and manufactures plastics and other chemicals from the raw material. Three main corporate anchors of Baytown, Texas are ExxonMobil, Chevron Phillips Chemical, and Covestro LLC. The ExxonMobil Baytown Complex, founded in 1919, is one of the world’s largest industrial complexes; the Baytown Refinery located there is the largest in the United States. The Covestro manufacturing site is their largest in North and Central America, producing a variety of high-tech polymer materials, and the Cedar Bayou plant, in operation since 1963, is Chevron Phillips Chemical’s largest manufacturing site in the United States. City Manager, Rick Davis, adds that the total expense for the Mall project is expected to be $100,000,000, with a $70,000,000 commitment from the city, the Texas Department of Transportation, Harris County, the developer, other property owners, and the Tax Increment Reinvestment Zone Authority for contiguous transportation improvements including the reorientation of traffic off of Interstate 10, to make sure that most of it comes to the new San Jacinto Boulevard. 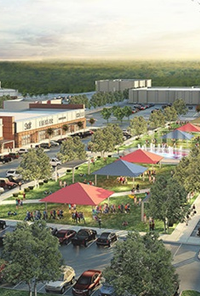 Another example of revitalization in the city’s older, southern part is Baytown’s Arts, Culture, and Entertainment (ACE) District, where the city has already invested $3.5 million in a Main Street project, building a town square in the old community of Goose Creek. “Baytown is the product of three communities coming together – Goose Creek, Pelly, and Baytown,” says Davis. “So we have, from way back in the day, certain Main Street corridors that have not been invested in to the degree that probably they should have been. They represent not only opportunity to us, but also our past and our heritage. And our citizens, through our strategic planning efforts, have identified the preservation of our historic areas as being one of the top priorities for them. Speaking of sustainability, Davis states that Baytown, Texas is the only community in the area that has both a nature center and a wetlands center, making it a hub for environmental education in the region: “We took an old subdivision that had been wiped out by a hurricane and we turned it into a nature center; we turned another old building – an old bowling alley on Market Street, close to where City Hall is located – into a wetlands education center. We are the beneficiaries of the generosity of some of our corporate partners, allowing us to present educational programs, year round.” In addition, the city is currently applying for an $11-million grant, part of the BP Deep Horizon Oil Spill settlement monies, to combine the nature and wetlands centers into a new, state-of-the-art, 27,000-square-foot facility that will offer a wide range of educational and environmental programs along with new recreational and eco-tourism opportunities. Check out this handpicked feature on Jackson, Mississippi – The Best of the New South.